Mo Ryan is an artist who flows with the go (a favorite phase of hers). 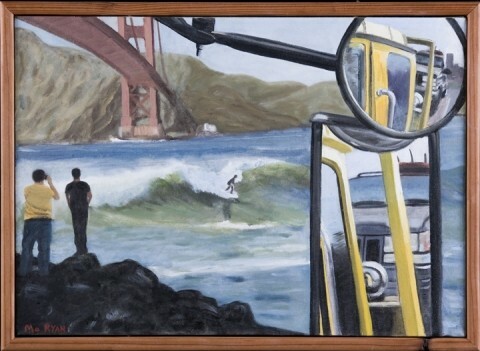 She paints tow trucks to commemorate the many times her vehicle has been hitched up to one, and she almost always features a glimpse of surf in her work. It's the beach that creates a happy vibe in her images, letting the viewer know that everything's going to be okay--even if your car is getting carted away. And if her work must be labeled as "surf art," think of it as conceptual surf art, the thinking man and woman's visions of sand and surf. # Ryan started painting around the same time she started surfing: while obtaining a business degree at Cal Poly. After taking a painting class with professor and local artist Joanne Ruggles, Ryan decided to extend her education's lifespan by pursuing an art minor. She eventually moved to Santa Rosa and got a job that made use of her business degree. When her stint as a business professional came to an end, she opted to return to the academic world of art at Sonoma State University where she was a sculpture major. While at Cal Poly, Ryan had learned to paint in acrylics, but at Sonoma she learned a new medium: oil painting. It was there that her skill as an artist was pushed in new directions. "Sonoma State really pushes you conceptually, so, basically, if you busted out a landscape they'd laugh at you," Ryan said. "There has to be something there." Gallery owners are apparently spotting Ryan's "something there," because the Santa Rosa resident is exhibiting in Capitola, San Luis Obispo, San Francisco, Dana Point, Cayucos, and Hawaii this fall alone. It's no coincidence that the majority of these exhibits are in close proximity to the ocean. Ryan and her husband take a lot of surf trips, traveling across California with a couple of Ryan's paintings in the back of the car. That's how she ended up with an exhibit at San Luis Obispo's Sextant Winery. "I was in Mexico and met the guy that works at Sextant Winery, and he said he was in charge of putting on a show at Sextant, and they wanted beach culture," Ryan explained. "I had six paintings in the back of the car during the trip, and I showed them to him. In a way, it's random--but in a way, it's not, because it's all about connections." # Ryan said that the majority of her subjects comes from life experiences, like her painting of a guy sitting in a golf cart and watching the surf, a longboard strapped to the roof of the cart. She saw him in Hawaii and knew that she had to paint him. Then there's The Search, a painting of a large, green knot. According to Ryan, the painting represents her pursuit of knots of experience, which usually involves "spending undefined time in various places where life takes you." She paints lifeguard towers that have dotted the beaches of Hawaii for a surfer's eternity and are now being replaced. Ryan isn't afraid of nostalgia: an old car or a beach scene that looks somehow dated. Each of her tow truck paintings contains a different perspective. 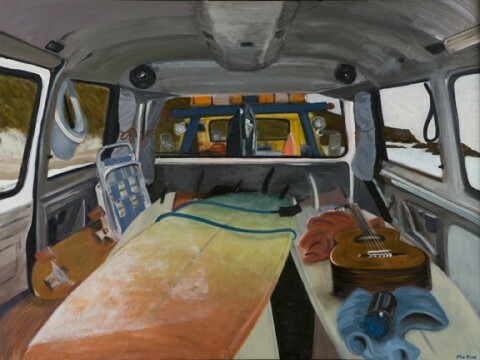 In Apartment B, Ryan created an inside perspective of a van equipped with a folding chair, guitar, and surfboard. A close look through the windshield reveals a limited view of an attached tow truck. Hana Hou, Hawaiian for "one more time," affords a view of someone surfing beneath the Golden Gate bridge. 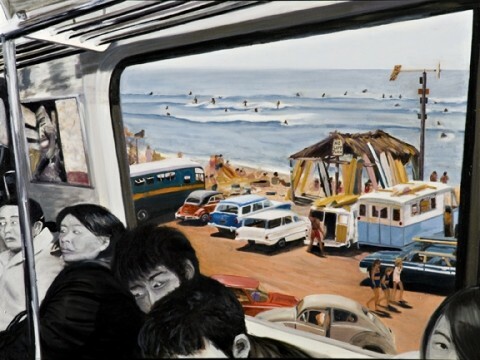 A mirror in the right corner of the painting reveals that the viewer is sitting in the passenger seat of a tow truck. The "one more time" refers both to another wave and yet another tow. # Ryan's playful approach to the fact that her car breaks down--a situation that might prompt most people to curse and demand "Why me?" --may be one of the reasons her paintings are so popular. She estimates that about 50 percent of her work comes from commissions. And a lot of non-surfers end up buying her work because the sunny, colorful subjects evoke ideas of escape and vacation. "They're generally happy paintings," Ryan said. "Even though my car is getting towed, you've got everything with you and the surf's right outside the car." Mo Ryan's artwork will be displayed at Sextant Winery Tasting Room, 3536 S. Higuera St., suite 250, through Nov. 5. To contact Sextant Winery Tasting Room, call 542-0133. For more information about Mo Ryan, visit www.moryanart.com. Arts Editor Ashley Schwellenbach surfs the froth of a cold mug of root beer. Send ice cream to aschwellenbach@newtimesslo.com.